Well got back to Korea! * 웩 (wak) : the sound of vomitting.. ㅠㅠ but this time he expresses his feeling like this.. Anyway I came back safely! Thanks to Singapore eels, I finished my performance without any accident and took a deep rest ! Felt a lot about Singapore Cri! It was my first time visiting, but so much beautiful city it was.. most of all so clean.. weather was fantastic.. I saw here and there, there are a lot of eels to wanna know about what I thought at the beach.. I was calculating the exchange rate of Singapore dollar and payback taxes from the airport.. I bought it unawares to my mom..
And from time unknown.. Facing camera lens is more frequent rather than facing people”s eyes..
Agonizing.. what if I lose myself..
are the same as people”s eyes who wanna communicate with me after all? I also have a horror of complicated things as like me ㅋ Enjoy first cri.. Thanks to your morning lunch-boxes, Stuffed food into my mouth! But did some emperor shopping, I”m…. little bit…..afraid of…….. the day of receiving my credit card statement……….. Please pray for my safety..! two days later, suv will come……………….Tada! who person knows about how to make a chicken rice? Ah.. I wanna eat one more time.. In Singapore my lunch-box menu was Chicken Rice all the time. The next show time is Hong Kong~! Anyway about 600 photo were taken for 4 days cri.. the problem is that those were taken by HulRangEe..
First of all, 100 or so without upper clothes..
Then for american fans, let”s have FM in the Itaewon, gogocri! I will show you something cool….in ITAEWON! Korea Encore.. wanna do.. wanna do.. wanna do.. petition cri! I made a guess and it was correct.. ㅡㅡ happy birthday annie!! I can eat Low-fat Tuna sqeezing out oil.. can eat sashimi.. do you know how calorific the squid is cri? Should I learn from Moon Mason”s dad… He told me that he”ll teach me continuously..
Well I usually didn”t use English, really it is forgotten in my head. No.4 Keep concentrating on the next work as I usually do. No5. What the hack of English, just do the Encore FM of Asian Tour!!! Maybe No1 is the fasttest way? 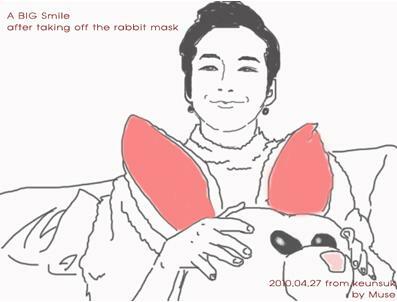 (* He was curious about how did we recognize him in Rabbit Suit. I”m bored.. I”m gonna give you a quiz, and gonna give a gift to the one who answer it. Attension Please cri! OK.. The name of Asia Tour Partnership company?????!!!!! Quiz. Where is the second place to be introduced by my clip of the Seoul UCC Contest? Nop.. wait a minute.. he wrote ChungGaeChon.. Should I take it? What should I do… Right or not.. Majority vote! ChungGyeChon and ChungGaeChon are different.. Cause I”m an honorary ambassador of Seoul city. kk OK admit cri.. the gift will be uploaded to the next post..